At our office, we hear numerous questions each and every day from our patients about a variety of dental concerns. One, in particular, is that of the use of fluoride. Fluoride is very important for your overall dental health and without it, your teeth are put in jeopardy. Fluoride has become a mainstay in the dental community, however, its use has been put into question over the last decade as new research has been analyzed. In this article, fluoride is examined as well as its benefit for you, uses and how safe it is for your dental health. How Does Fluoride Help My Dental Health? The enamel on your teeth is made up of minerals and when plaque starts to build-up, demineralization occurs on the surface of your tooth. If the tooth is allowed to continue to demineralize, it will eventually lead to tooth decay. Remineralizing your teeth will help decrease your chances of tooth decay and increase your overall dental health. Fluoride is a naturally occurring mineral and is the 13th most common element on earth. Fluoride helps with the remineralization of teeth in two ways: One, it can be swallowed by drinking water with fluoride in it, which will then be absorbed into your bloodstream. The fluoride will become part of your saliva and strengthen your teeth from the outside. Secondly, fluoride can be applied directly to the outside of the tooth by using toothpaste containing fluoride or a fluoride rinse from your dentist. Both children and adults can benefit from the use of fluoride. When Should I start Using Fluoride? have erupted. You should, however, use a small quantity of toothpaste as the photo to the right indicates. 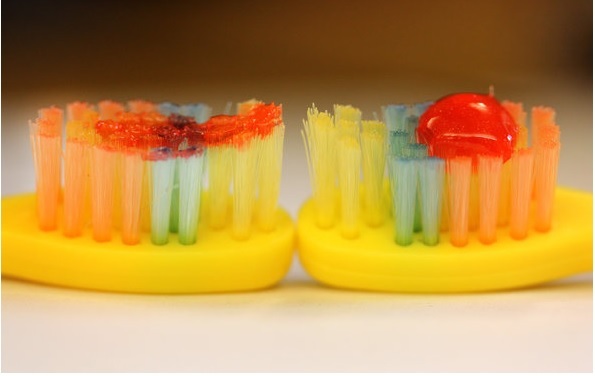 The study indicated to brush their teeth with a “smear” of toothpaste twice a day. This will limit the chance of fluorosis occurring while still giving enough fluoride to maintain healthy teeth. If you feel you or your child is not receiving an adequate amount of fluoride, talk to your dental professional about your options. At our office, we see a great reduction in cavities in both children and adults when they use fluoride in some form on a regular basis. If you have any questions about fluoride and whether or not you should be using it, give our office a call. We will be happy to answer any questions you may have.